Nearly every business has use cases for a shared mailbox. Prior to Microsoft including shared mailboxes in Outlook and later Office 365, admins would instead use distribution lists, mail forwarding, or even public folders to allow multiple people to see an email. An email-enabled distribution list is a group of people who will all receive the same incoming email, but none of the members of that group will know if the others have responded. This is a real problem that can cause mail to be ignored or multiple replies to occur. Mail forwarding is more of a one-to-one scenario where an email addressed to one person gets delivered to another — which is fine, but only that person is aware of the incoming email. If it’s an incoming sales inquiry, you might want it to go to any available sales staff. 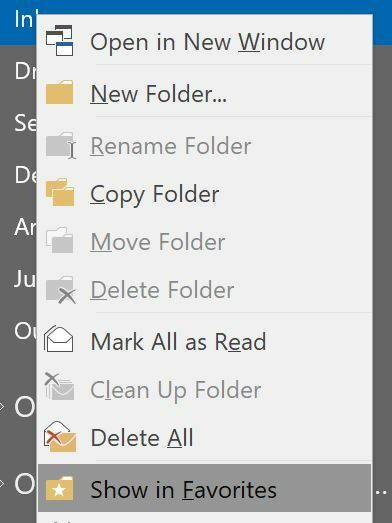 A public folder is a specific group folder that can receive email, but the members have to remember to visit that folder, and it’s annoyingly low in the folder list within Outlook, making it easy to overlook. Further, Microsoft has more than once threatened to get rid of public folders and is currently making statements that look a lot like they are going to remove distribution groups. So it’s time to know about shared mailboxes. A shared mailbox is a fully functional mailbox, but it is not anyone’s primary mailbox. Instead, it is a mailbox that an individual or group needs to monitor and be able to reply. Almost every business has a need for this functionality. Instead of an alias: You want your clients to send email to a generic email address and have a small group of people be able to see and respond to those emails as that address. [email protected] might be an example of this kind of thing. Instead of keeping a former employee’s account active: An employee leaves and you want to give someone else access to that mailbox and have it continue to receive email during the transition. The shared mailbox provides a better solution than just forwarding because it provides access to the entire mailbox. We use this for transitional purposes so the new person in that role or manager can move the contacts, calendar, and other information in that mailbox. Instead of forwarding: Your website has a contact address in it. Previously, you created a distribution group but there was no way to know if someone had already answered that email or not. With the shared mailbox, everyone can see whether the original email has been replied to, and they can view the reply in the Sent items folder, too. Instead of keeping PSTs around: Yikes! Do people still do this? Yes, they do. Talk about old school. PST’s are unstable, limited, and likely to get lost. With a shared mailbox, you can keep that information safe in your online Exchange server. The specifications for what a shared mailbox can do have varied over the years. It was 5GB, then 10GB; at one time you couldn’t send from it. Today a shared mailbox has a 50GB size limit, you can send and receive from that mailbox, and the sent messages stay with the shared mailbox. It does not require a license unless you want to add archiving to it and there are no user credentials associated with it. It’s not some stripped-down limited feature. It’s now a fantastic fully featured solution for real business problems. Microsoft has an excellent easy to follow document on setting up a shared mailbox, so I’m not going to repeat those steps. Please go here for instructions on how to create the shared mailbox. Instead, I’m going to share some tips with you that make the experience that much better. I want to point out an often missed setting that puts sent mail from a shared mailbox into the Sent folder of that mailbox. If you don’t change this setting, then sent mail ends up in the personal Sent folder of the person that replied. This is generally not the function that people expect. To remedy this, go to your Office 365 Admin Center, Expand Groups and select Shared Mailboxes. Next, check the box for the shared mailbox you would like to change the setting for. Finally, slide over to ON at least the Copy items sent as this mailbox item. I’ve highlighted these steps below. You may need to walk the end user through the process of finding the shared mailbox in Outlook. It’s going to show up automatically so there is zero setup to do on the client side. But since it’s an additional mailbox you might need to scroll down in the folder list to find it. Anyone using a shared mailbox may find it useful to pin the Inbox to their favorites. You’ll also want to show people how to send from this mailbox. Once the shared mailbox has been added to Outlook, the From box in the mail composition windows will have a drop-down arrow. Here you can pick the address you want as the From address. Now don’t forget that this is fully functional mailbox, which means that you’ve got Shared Calendars and Shared Contacts available to the group with access to this mailbox, too! Imagine the possibilities. These items can also be pinned to favorites. Some people prefer to use this feature over your other options in Groups or SharePoint. I would take a hard look at Groups before making that decision. Groups is a relatively new feature in Outlook that might serve this purpose better. What are the limitations of a shared mailbox? Just a couple of items to note. Shared mailboxes can only be accessed from an Outlook desktop client or in Outlook Web. Meaning if you want to get it from your phone, you’ll need to use the phone’s browser. That can be a bummer for some very mobile people. You can send and receive encrypted email. I see some notes around the Internet that you can’t, including in that article that I linked for you, but it’s untrue. You absolutely can. Did you know you can convert an existing users’ mailbox into a shared mailbox? Of course, as soon as I mentioned that you can use a shared mailbox to manage the email for an employee no longer with the company you must have assumed that. But you also know that you can convert a shared mailbox into a “real” mailbox? Well, you can and actually, both of these things are very simple. You just click the Convert link, wait a few minutes, and it’s done. You’ll do this from the Exchange Admin Center. 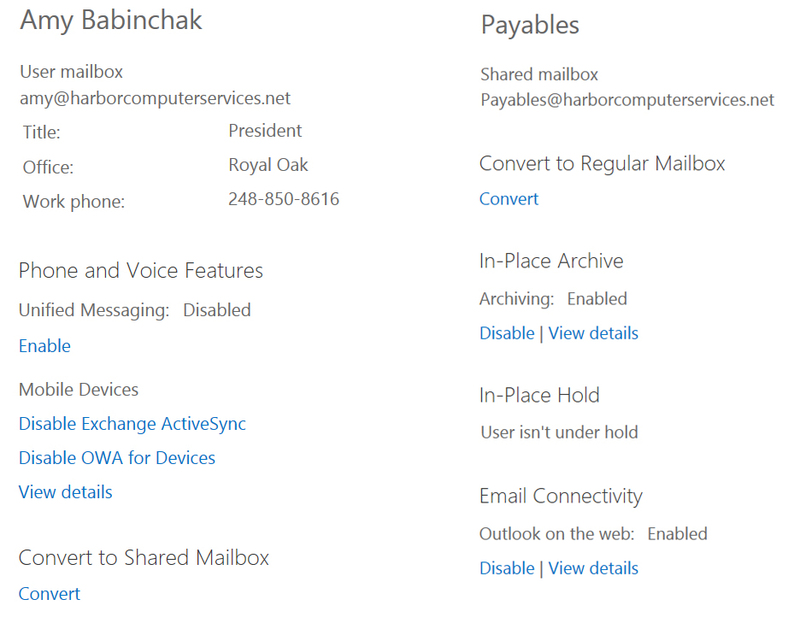 On the left, you see my personal account and a Convert the shared mailbox option. On the right, you see a shared mailbox with the Convert to regular mailbox option. Rarely to do we get treated to a single click configuration with Microsoft, but in this case, just click. It’s that simple. Once you get started with shared mailboxes, you’re going to find a bunch of reasons to use them. Shared mailboxes are the solution for keeping mail at the hands of those small groups that need it and keeping that mail safe on the network. Just watch out for those couple of gotchas I mentioned and you’ll find this a very easy-to-manage solution. Actually, you can access share mailbox on Android phone Mail App (not Outlook App), configure using IMAP access with username in this format "user email address\share mailbox email address", password is the user password. Just Google it, you shall find most guide from university to their student. Can't tell it work on Apple devices or not since I don't own any of them. Now that groups are out i saw a difference in shared mailboxes. you can access your shared mailbox from everywhere even mobile native app standalone. use the active user (unlicensed) that is generated automatically when creating a shared mailbox and you are there. i tested it on outlook with no other account and owa of course even in mobile app as exchange not imap. as you said a unlincesed user can use a shared mailbox...so, free 50 gb for you! Does anyone know how many concurrent connections you can have to a Shared Mailbox? We have a mailbox which is accessed by around 20-30 users on Exchange 2010 which is starting to fall over. Looking at migrating to 365 and this feature could be really useful. For this: then sent mail ends up in the personal Sent folder of the person that replied. Can this be done with Exchange 2016? If one users delete an email, all users will see it deleted, right? Korkut, Yes everyone will see the email as deleted. It will then be located in the deleted items folder. It works just like a regular mailbox. Jeff, No the email doesn't have to be in the sent items folder in the personal mailbox. It can be in the sent items folder of the shared mailbox. I noted a check box for that in the article. I'm not experienced with Exchange 2016 server but I think that this feature probably does exist there also since O365 and Exchange are the same platform. Dave, I was unable to find an authoritative answer to your question. I would recommend asking the question directly to Microsoft through the chat window on the exchange online site. Hi... Am struggling with finding a "shared" email box in Outlook 365. Does anyone know if there is some tracking on the messages received on shared mailbox? I mean, is it possible to know if a message has been moved to another folder, if it was replied, if someone has deleted it. I received this query from a manager of a specific department. Will the shared mailbox be deleted when the user account is deleted from AD? It seems to be working that way for us now, though it didn't use to do that. We want to be able to convert to a shared mailbox when an employee leaves, then delete the user account in AD. Is that supposed to work correctly with 365? 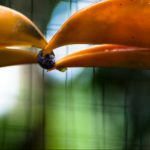 Does the OnPremise user can be granted Full Access and Send As forthe Office 365 migrated Shared Mailbox ? Is a user able to email the shared mailbox with a calendar invitation? Will the rules in regular mailbox be retained if converted to shared mailbox.